Recommended Campervans - Which Campervan will suit your requirements? Look forward to coming back to you for another trip. Which Campervan will suit your requirements? The Apollo Endeavour is a 4 Berth Camper, built to comfortably accommodate up to 4 friends or a family with young children. Light, economical and easy to handle, this is the ultimate in no-fuss road trips. Features include automatic transmission and side door entry. Without shower and toilet facilities we suggest you spend your night in camping grounds or caravan parks with opportunity to meet fellow campers and have a social time on your holiday! The Britz Voyager and the Mighty Double Down are 4 Berth Campervans with all the kitchen basics you need, with U-shape dining or outdoor table & CD Radio. Comfortably sleeps 4 adults in two double beds these vehicles are built on the Toyota Hiace Super Long Wheel Base, packed with features to make your journey a safe and comfortable one and has positioning for a total of two child restraints. These vehicles are also available in Tasmania. If you are looking for more space we recommend the Mighty Double Up – This automatic vehicle comes with all the comforts of a 4 Berth motorhome without the price tag! This vehicle comfortably accommodates up to 4 adults and is ideal for families as it can be fitted with both baby and booster seats. Other features include a fridge, gas stove, microwave, TV, shower and toilet and optional awning. The turbo engine and power steering ensure easy handling and a smooth ride for the penny-wise holiday maker. Looking to hire in Tasmania we suggest you look no further than the CT 4 berth Seeker - The CT 4 berth Seeker allows you to explore the wonders of Tasmania at your leisure in comfort and style. Seating up to 4 people, the Birdsville features a 6-speed diesel engine, power steering and a CD player in the driver's cabin, Digital TV, shower and toilet facilities as well as full kitchen equipment. The Paradise Family 5 Hi-Top is another purpose built campervan that can accommodate a family with young children or 5 adults (2 x double beds and 2 man tent with camping gear). This is a long wheel base vehicle with approx 50% more space than your standard Hi top camper. With plenty of storage the Paradise Family 5 provides both functionality and reliability you would expect from this modern campervan. If you are looking for more space we recommend the Cheapa 4ST Motorhome – The vehicle comes with all the comforts of a 4 Berth motorhome without the price tag! This vehicle comfortably accommodates up to 4 adults and is ideal for families as it can be fitted with both baby and booster seats. Other features include a fridge, gas stove, microwave, TV, shower and toilet. The turbo engine and power steering ensure easy handling and a smooth ride for the penny-wise holiday maker. The Hippie Hi-Top is ideal for budget conscious backpackers. This Toyota model comes fully equipped with all living equipment, bedding and linen and is ideal for 2 people – and also has room for a 3rd person (no more than 60kgs). With a comfortable and functional interior, spacious dining and sitting areas and plenty of storage the Hippie Hi-top has the great functionality and reliability. This vehicle offers excellent value for money. Also look out for the 2/3 berth Juliette Campervan – this compact vehicle comes with all the mod cons i.e. fridge, a microwave and gas stove. It is fitted with a double bed and a single bed and can accommodate up to 3 adults. If you after a slightly larger vehicle we suggest the TAB Hi-5 Campervan – This vehicle is ideal for groups or families and comes fully equipped with a large fridge, a microwave, sink and gas stove. This campervan is just as comfortable is you take it to the outback, the city, or just down at the beach. Other options include the funky Jucy Crib or TAB Chubby campervan. When travelling to Tasmania you may wish to consider the AutoRent High Roof or Go Cheapa Hi-Top. The Britz 4 berth Explorer has plenty of space to relax with a large dinette day area, mini kitchen plus LCD & DVD for entertainment. With toilet on board with pressurised hot and cold water shower. The automatic turbo engine and power steering ensure easy handling and a smooth ride. The Explorer is a spacious vehicle, packed with mod cons and safety features and has positioning for a total of two child restraints. The automatic Euro Slider is the first slide-out motorhome launched for the Australian rental market. Designed using state-of-the-art 3D modelling, the unique slide-out panel in this vehicle creates more space than ever before. The Euro Slider also features cruise control, iPod docking station, private bedroom and a separate shower and toilet along with all the other modern conveniences that you would expect. Another suitable option will be the AAM Wanderer Motorhome – this vehicle can accommodate up to 4 people comfortably featuring a large double bed over the cabin and a dinette that converts into a second double bed. Other features include a fridge, gas stove, microwave, TV, shower and toilet. The turbo engine and power steering ensure easy handling and a smooth ride This is a superb vehicle for a family of 4, or for couples wanting a bit more room to move. Looking for a vehicle to travel in Tasmania we suggest the Cruisin CT 4 berth Seeker or the AutoRent Hertz 4/5 berth Motorhome. The LJ 2 Berth Voyager is the pick for a couple. Features include heated/air conditioned cabin and living area, shower and toilet, large double bed and fully equipped kitchen including microwave, gas stove and refrigerator. Ample storage space and a powerful and reliable 2.7 litre engine complete the perfect touring vehicle for discerning couples. If you after a more affordable vehicle then look no further than the Mighty Deuce which is for two adults but comes equipped with a toilet and shower, along with a larger living area. The Mighty Deuce 2 Berth onboard toilet and shower make this the most cost effective, self-contained vehicle on fleet. This automatic vehicle also features air-conditioning and heating, a large comfortable double bed and kitchen facilities including; microwave, gas stove and refrigerator. 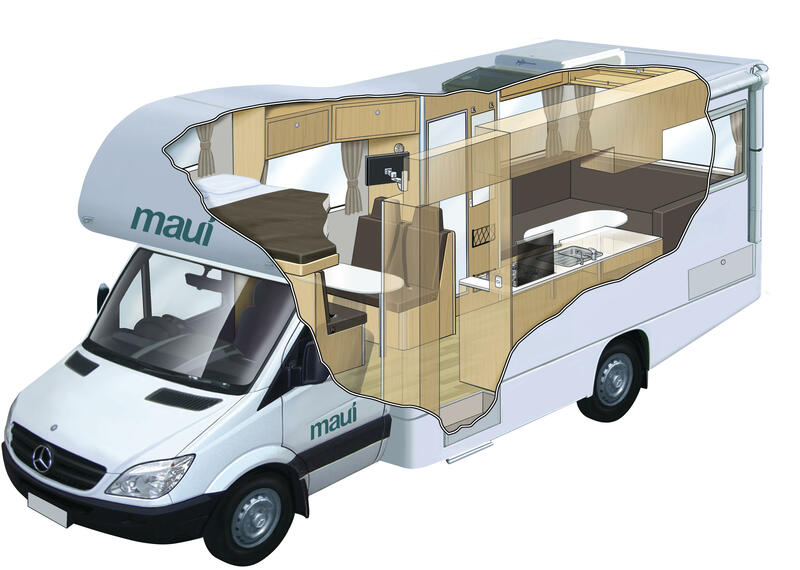 Another great option is the Maui Ultima – which offers 2 beds configuration i.e. king-sized bed or two singles. Vehicle is fully equipped with shower and toilet and has plenty of storage space. Added features include slide out the TV screen & DVD player and a slide out BBQ. When travelling in Tasmania you can opt for the AutoRent 2/3 Berth Motorhome or Maui Ultima. Recommended Brands: AAM, Mighty Campers, AutoRent Hertz and Maui. Try the Euro Deluxe which will delight large groups and families who value comfort, innovation and quality. With 3 large double beds there is plenty of room for everyone. This vehicle boasts smooth handling and is surprisingly easy to drive. The thoughtfully designed interior features all the comforts you would expect of the latest generation of recreational vehicle. The Euro Deluxe is a secure and convenient home away from home while discovering Australia and New Zealand. You may wish to experience the Maui Platinum River which can sleep up to 6 people comfortably - perfect for families seeking extra space and style. Kids are safely buckled up in the back, entertained by their favourite DVD. Features include a large fridge, china crockery, coffee plunger and decent wine glasses. The shower is hot and towels are abundant. Of course, there is a spacious living area, plus vast storage space for all your gear and your family's or friends. With all the comforts of home, the KEA 6ST Motorhome offers the ultimate motorhome experience for a family of up to 6 people. Large and spacious inside, two separate sleeping/living areas provide real flexibility. On a lazy day you can leave the bed made up, passenger seating directly behind the driver means you can keep an eye on the kids with belted seating for 4! All extras are taken care of with a generous kitchen, spacious bathroom, extra-large beds, open-plan living, and many more features to make your holiday a pleasure. 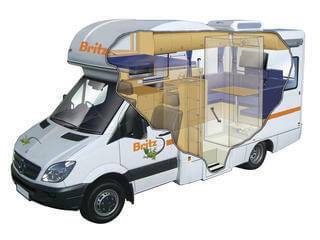 There is also the Britz Frontier and Britz Venturer – both priced very competitively and affordable. Recommended Brands: Kea, Maui, Britz, Apollo or Cruisin Motorhomes.